Ann Craig - distINKtive STAMPING designs - Stampin' Up!® Australia: The New Holiday Catalogue is Here! 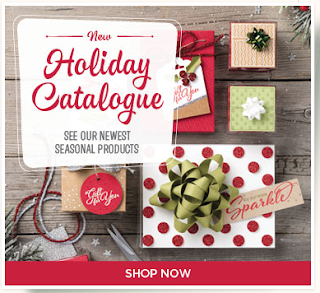 The New Holiday Catalogue is Here! You are going to love this catalogue and all the gorgeous contents. I am trying so hard not to buy everything, but the sets and bundles are just so gorgeous. Take a look at the catalogue by selecting the image below, and when you can no longer resist the wonderful products, you can place an on-line order via my store! Just to tempt you a little more, Stampin Up! also has a terrific Host Reward opportunity for anyone who hosts a qualifying party/workshop or who places an individual order of $450 or more. 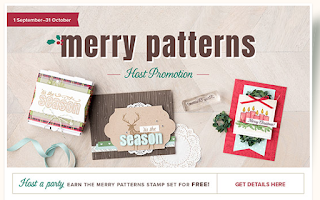 This beautiful Merry Patterns set will be added onto your normal Host benefits so it becomes a win win situation. Read all about the promotion and how you can earn it. Stay tuned for some pretty samples from this set - I have earned mine but it hasn't arrived yet, so check back again in a couple of days. Until then, enjoy browsing the catalogue - perhaps even gather some friends for a workshop - I love teaching techniques and sharing my ideas. Contact me for further information. Successful corporate events desire good planning and proper execution. In truth, such events are necessary to manufacture a public picture of a company. To make corporate event venues San Francisco successful, we need to invest plenty of time in selecting venues and suppliers.